Please click on the product name to read our customers testimonials. I saw results within one day of using this product. I highly recommend it. I just started using this item yesterday and, I can already see the difference. My heels were rough and cracked and, in one day, I can see the difference. The cracks aren't as noticeable and my feet are really soft. I would definitely recommend this product!!! Thank you for making such an amazing product. AMAZING, Awesome product. It works within one day. I am a Diabetic with deeply cracked heels and pain. Purchased this product yesterday day and actually applied some in the parking lot of the store. Re-applied last night and put socks on. This morning the results were Amazing. My heels are much softer and hydrated. THANK YOU. I can't wait to try other of your products. I went to a health fair and got samples of the heel balm. I'm a diabetic and have to care for my feet daily. I tried the heel balm for 4 days using up the samples. the results were great my feet feel nice and smooth and if you rub it around your nail beds it softens and your whole foot feels ands looks healthy. I have tubes of all types of foot creams. Heel balm will become #1 now. Thank you. Immediate relief from very painful cracked heel: every step a torment! Before flexitol I suffered with every step. Last night I applied Flexitol to crack. This morning I walked without pain! No other product has helped me this way. Thank you. Hello - 4 days ago I purchased Heel Balm. My expectations we not very high, since we've all heard miraculous claims before... WELL - this product ABSOLUTELY delivered ! I cannot believe how smooth my feet feel and how much better than feel - that is only after 4 days of use. Thank you for such a powerful and pleasing product! I have tried EVERYTHING for my dry, cracked feet including prescription creams. One day using Flexitol foot cream and the results were amazing! I knew it was an awesome product when my pedicure girl noticed how smooth and nice my feet were. This is the best product out there! This product is AMAZING. I saw positive results within 3 days of twice daily application. My feet were an absolute mess. So much so, I always hesitated to wear any type of footware without socks. Now, I go wear sandals without reservation. I highly recommend Flexitol Heel Balm. The best there is. My heels cracked so badly I taped them to be able to walk. Tried everything there was and even slept in plastic bags after slathering my feet in creams. Found this product about three years ago and I have sandal feet. I will never use any other products. Wanted to thank the manufacturers of the heel balm for delivering as promised...I had not heel issues but a nasty split in the callous on my right foot...in 2 days of use it was much better...in a week the split healed completely...please feel free to use this ...thx again. I have had dried cracked feet for two years I would wake up during the night with burning and bleeding feet. I had use everything I could get my hands on. Even two different Drs gave me a cream that didn’t work.I saw Flexitol in Walmart one I hadn’t used and the price was reasonable. Well I am happy to say after a month my feet are clearing up and I just may have feet that look good in sandals! Due to a serious health condition I must take medication that is very drying to skin- My feet develops cracks so deep my feet bleed - A pharmacist told me about your product around 10 years ago- it has changed my life- I now tell everyone it's the only product they should trust- I even have the salon where I get my nails done exclusively using your product only- thank you for an incredible product. I can only say that i have been looking for a product like this for years for my heels and hands, used medication and all types of creams and when my friend told me about this miracle cream i rushed and got it and the minute i put it on, my life has changed, my hands are very soft and my heels and feet look like a babies, this is truly something worth buying. The soles of my feet were cracked open, completely covered with scales and I was treated for several years with no results except becoming sick from the topical and oral medicines.I subscribed to a newsletter from a special doctor and decided to e-mail and ask his advice. He without fanfare said to use Flexitol. I did and my feet healed over night after years of misery. 18 years ago I moved from Florida (humid) to Arizona (dry) within a year my feet started cracking and and crusting. At some point I could hardly walk. After 3 years we moved back to Florida and I assumed my feet would go back to normal. 15 years later and after many doctor visits and many different creams, lotiona and prescriptions I was still the same. Then one day in our Sunday paper there was a coupon for Flexitol. What did i have to lose? I bought it and read where it said to use it for 2 weeks to see results. Yesterday I bought 4 pair of sandles because after only 5 days of using this product it is as I never had a problem with my feet. I will now continue to use it every day to make sure I never have to struggle with dry cracked feet again. I have been recommending this product to everyone I know. This letter is in reference to your product Flexitol Hand Balm for VERY dry skin. I wanted to write to let you know how well this has helped my situation with the dry skin on my hands. I have a hard time finding a product that will keep my skin moist without irritating when it gets into those cracks that have opened. Some products actually make the situation worse by burning when applied to those open areas. Your's does not burn and actually helps heal. It is by far the best I have used for my hands! I have suffered with this problem since 1981 and I can say I have tried just about every product and "cure" out there. 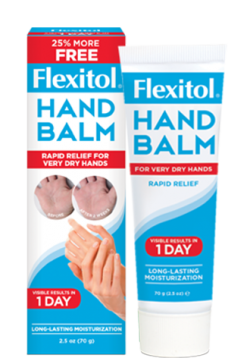 In the past 24 years nothing helps to soothe, heal, and protect like Flexitol Hand Balm. The hand balm is perfect for my hands as they were dry and cracking as they are constantly in water at work, it has been like a face lift for my hands, they look like they are 10 years younger, firm but supple! I was simply blown away just after a day you notice considerable softness to the hands after a week. I highly recommend it to others. I love this product and it is the only thing that relieves itching of my psoriasis.